Group Gordon’s Noor Qasim examines Brett Kavanaugh’s communications strategy in the aftermath of an unprecedented Supreme Court confirmation hearing. Brett Kavanaugh’s nomination to the Supreme Court consumed the national conversation for several months. Yet, in the past few weeks, the nation’s attention crystallized rapidly and rightly around the allegations of sexual assault from Dr. Christine Blasey Ford, Deborah Ramirez, and Julie Swetnick. The ensuing hearing, investigation, and confirmation of Kavanaugh drew the nation’s laser-like focus—perhaps the first time during this administration in which one scandal has not quickly surmounted another. Many on the right and left have drawn attention to the media’s role in shaping public perception of the confirmation process. Some of this attention has been substantive, much of it fear-mongering. But it’s worthwhile to consider Kavanaugh’s own media strategy for shaping his national image, particularly in his use of one of the oldest PR tactics in the book: the op-ed. 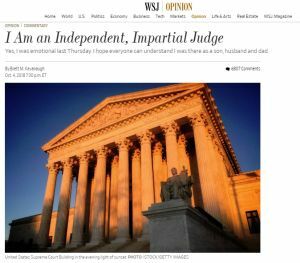 On October 4th, The Wall Street Journal published an op-ed from Kavanaugh. Following his angry, emotional performance before the Senate Judiciary Committee, one might have expected more fire. Clearly, Kavanaugh considered the concerns being raised about his temperament and chose to take a different approach. Rather than appear again on television, Kavanaugh chose to return the conversation to the calm consideration of the page. Op-eds are valuable in that they’re unfiltered vehicles for a message. They highlight the author’s perspective on an issue and, placed in a strategic publication with the right readership, make a case directly to the target audiences that matter most. Kavanaugh’s op-ed in The Wall Street Journal accomplished this. At the time of the op-ed’s publication, the outcome of the confirmation process was likely not in question, but for many his reputation, partisanship, and fitness were. Kavanaugh understood that the concerns of those still left to convince lay more deeply with his lack of civility than with alleged reprehensible conduct. In the piece, Kavanaugh hedges these concerns by defending his intellectual and emotional qualifications. He walks the reader through five long paragraphs on the meaning of judicial temperament and mentions the accusations against him only once. And while he devotes two paragraphs to alternately defending, explaining, and apologizing for his behavior in the hearings, he describes his testimony first and foremost as “forceful and passionate.” The piece concludes with a boilerplate affirmation of his belief in the Constitution. In both form and function, Kavanaugh’s op-ed sends a message—I am careful, thorough, and thoughtful, I was simply under extraordinary pressure. This message likely played well with his target audience. And while he undoubtedly hoped to convince the nation, Kavanaugh’s choice of The Wall Street Journal signaled for whom this message was most directly intended: the intellectual, elite right and center – those who likely still supported a Kavanaugh confirmation but were rattled by his behavior in the hearings. Of course, Kavanaugh’s op-ed sparked further questions about what actions are suitable for a potential Supreme Court Justice. But it was clearly a calculated risk, with a long-term goal in mind. As of October 6, Kavanaugh is serving a lifetime appointment to the Supreme Court. Kavanaugh’s op-ed was an attempt to restore at least some of the nation’s trust in his ability to serve on that court. The question remains whether he will ever convince the many who believe he does not belong there.